American culture has been too preoccupied with condemning the oddballs. It’s a relief when a small movie like Get Low comes along to remind us why they’re so interesting, and why Murray isn’t just some aging goofball. There is a type of moviegoer, generally between the age of 30 and 45, who will witness Bill Murray in a movie and laugh at his every tic, his every moment, his every step forward. Yes, Bill Murray is a very gifted comic actor, quite possibly the 21st century’s answer to Buster Keaton. But such a preprogrammed response misses the point of Bill Murray. It suggests very highly that he is some jester for our steadfast amusement rather than a soul to be genuinely interested in. Small wonder then that the roles that Murray has taken in the last ten years have involved sad loners in their autumn years. 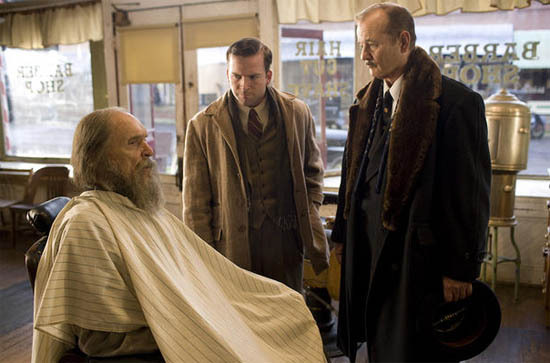 Given such thespic expectations (and such tittering moviegoers: two of whom were at the screening I attended), it’s a relief to see Murray playing an opportunistic funeral director named Frank Quinn in Get Low, a supporting role comparable to Wild Things‘s Ken Bowden, Cradle Will Rock‘s Tommy Crickshaw, and Mad Dog and Glory‘s Frank Milo. Few filmmakers seem to ken that Murray best anchors a film when his hangdog mug scatters into the background. Maybe director Aaron Schneider gets this because he’s also a cinematographer. But a movie set in the 1930s concerned with how misfits are judged by a town square’s cruel metric works better with Robert Duvall cast as the misunderstood “freak” and Murray as the lonely man riding his coattails. Get Low takes it inspiration from Felix “Bush” Breazeale, the nearly forgotten figure who, according to James Ewing’s It Happened in Tennessee, decided to attend his own funeral on June 16, 1938. Breazeale’s funeral was heavily publicized in the papers, in part because Breazeale had been charged with murder many years earlier, with the charges later dropped. But where the real-life Breazeale sifted through the crowd at funeral’s end, signing programs and shaking hands, this movie’s “Felix Bush” views Breazeale’s eccentric act less as an individual’s unusual exertion of identity and more as the tragic aftermath of a misfit’s whims skimmed over and ignored by a capitalist system. This Felix Bush is picked on by the local townsfolk. He introduces a raffle component to his funeral during a radio appearance, encouraging greater throngs to attend. The film’s Uncle Bush is more familiar with marketing techniques. He takes a photograph with his long mane in disarray, only to have a barber trim himself for the big day. (Not so for the real Uncle Bush.) This film’s funeral is held so that Felix Bush can see what stories have circulated about him, whereas the real Bush was a fastidious type who wanted to see his service conducted in the right manner. Get Low takes the position that Bush’s funeral is an act of corrective catharsis, of setting matters straight before a hostile crowd. Yet despite these concessions to conventional narrative, Get Low mostly works. It feels less like a biopic because of its leisurely pace, its efforts to establish a small town atmosphere, and its willingness to maintain Bush’s personal secret for so long. It understands that, when you have actors as good as Duvall, Sissy Spacek, Lucas Black, Murray, and Gerald McRaney, you let them play out the moments. It has some funny lines, most of them delivered by Murray. Frank Quinn defines his sales track record when he grumbles, “I sold twenty-six of the ugliest cars in the coldest day of Chicago.” Shortly after Bush threatens to put the kibosh on the gambit, Quinn says, “Is it just me or is he extremely articulate when he wants to be?” Yet Murray’s character, for all of his quips, is lonelier than Bush, even when he’s sitting around a table and taking in local gossip. We’re left to wonder why this man had to flee Chicago so late in life. Quinn offers some nebulous story about switching sides of the bed shortly after his wife left him, but it’s just one small part of the story. Just as the stories circulating about Uncle Bush, very much the local recluse, hardly tell us anything we need to know about the man. And this narrative approach, helped in large part by screenwriters Chris Provenzano and C. Gaby Mitchell, very much turns a shaggy dog tale into something more memorable. There’s a certain irony in this movie opting to print Felix Breazeale the legend, rather than Felix Breazeale the man. Sometimes, Get Low needlessly overplays its hand — such as the brazen need to telegraph its time period with “I’m Looking Over a Four Leaf Clover” or the lost love plot that never quite congeals, even when Duvall bangs on the door in the pouring rain. But its efforts to capture some impression of a bygone time, fusing these with an undervalued human gusto, reminded me of a needlessly forgotten 1999 film called Man of the Century. American culture has been too preoccupied with condemning the oddballs. It’s a relief when a small movie like Get Low comes along to remind us why they’re so interesting, and why Murray isn’t just some aging goofball.